Big Finish: Sherlock Holmes - The Speckled Band Review | Warped Factor - Words in the Key of Geek. Andrew East reviews the first Sherlock Holmes production from Big Finish. We have two firsts with this Sherlock Holmes story. It is the first Holmes production from Big Finish, starring Nicholas Briggs as Holmes as Richard Earl as Watson. It is also the first Holmes adaptation, of the ones I have been listening to, where I already knew the solution to the mystery. The reason for this is a vivid memory of the television adaptation of this story starring Jeremy Brett. I distinctly remember the scene of the snake (the Speckled Band of the title) slithering through the air vent and down the bell rope which, listening to the story, was probably a ‘flashback’ where Holmes explains what happens, seeing as, in the actual events of the story this is never ‘seen’ by the characters with Holmes and Watson being in complete darkness when they encounter the snake. Big Finish’s Sherlock Holmes range has been popular enough to warrant further seasons. Not attempting a story by story adaptation of the ‘canon’ they have dipped into various Sherlock Holmes projects from a variety of authors, not just Conan Doyle, including one man plays, Holmes vs the Ripper and an adventure on the Titanic. 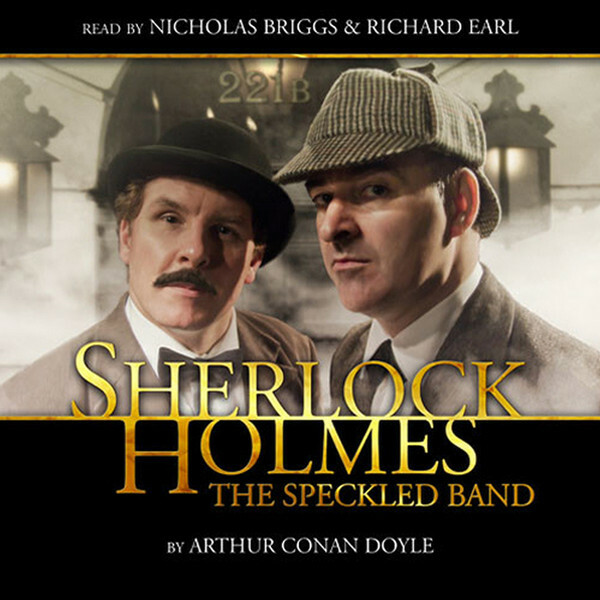 This short audio adaptation of The Speckled Band is one of a minority of Conan Doyle-penned stories. Released in 2011, and available as a download only, it features Briggs, Earl and Jane Goddard as Helen Stoner, whose twin sister has died in mysterious circumstances at her step-father’s house. With such a small cast, Earl voices any other characters, which works well as the story is being ‘narrated’ by Watson. Briggs is a good Holmes. Nicholas Briggs gets a lot of criticism from Doctor Who fans. Sometimes it’s because of his ubiquity, sometimes his ‘jack of all trades; master of none’ approach to writing, sound design, music, directing, producing and acting, sometimes his writing (particularly for the 4th Doctor adventures). I’ve never had a real problem with his work though. That’s not to say I think he can do no wrong. I did at one time go through a period where I was getting fed up with constant Dalek stories from Big Finish, particularly those written by Briggs, coupled with the fact that I was finding his Dalek voices very hard to listen to. Hearing Briggs performing other roles in stories always pulled me out of them because his voice is so familiar from things such as the Big Finish podcast. At the beginning of The Speckled Band I, initially, found the same problem. But as the story moved on, I found Brigg’s performance outweighed the familiarity of his voice. He is a very good Holmes. In Doctor Who he tends to play small parts which mean his actual acting ability isn’t given time to impact on the listener. Here, in Sherlock Holmes, he is central and, fortunately, he shows he has the ability to carry it off. That said, even better, is Richard Earl’s Watson. He is superb both narrating and performing as Watson, and as some of the other characters. As a double act Briggs and Earl complement each other well and I look forward to hearing more from the pair. The third member of the cast is Big Finish stalwart, Jane Goddard. Her slightly high-pitched voice always reminds me of an English Sandra Dickinson, and she is best known for her various Pakhars in the Bernice Summerfield range (and a couple of Whos) – a gerbil-like race of negotiators. Her performance here as Helen Stoner is much more grounded but does have a slightly hysterical edge (naturally due to the terrible events which have befallen her twin sister) and her particular pitch of voice works well in bringing across this restrained, yet disturbed Victorian lady.